Lower Itchen Fishery finished their salmon season with 258 salmon, making it the second highest record since 1954 and only nine fish away from matching their 2010 record breaking year. The fisheries five year average from 2008-2012 is 204.8 fish which is nearly double the five year average of the previous 10 years figures of 105 (1998-2002). 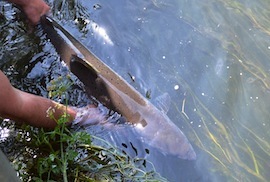 Congratulations to Gary Perks, who’s 20lb salmon caught in June is the fisheries largest salmon for 2012. There were many fish seen in excess of this ranging up to one estimated to be well over 30lbs. With the salmon and trout season coming to an end, our thoughts now turn to coarse and grayling fly fishing for the winter months and the winter works on the river.